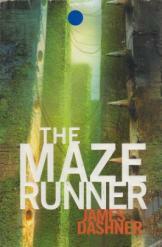 The Maze Runner by James Dashner Sci Fi, book in a good condition, all pages intact. Everything is going to change. Thomas wakes up in the lift and only remembers his name, and kids welcoming him to the Glade. No one knows how they arrived at the Glade, how to solve the maze surrounding the Glade, and how to retrieve the dark secrets.